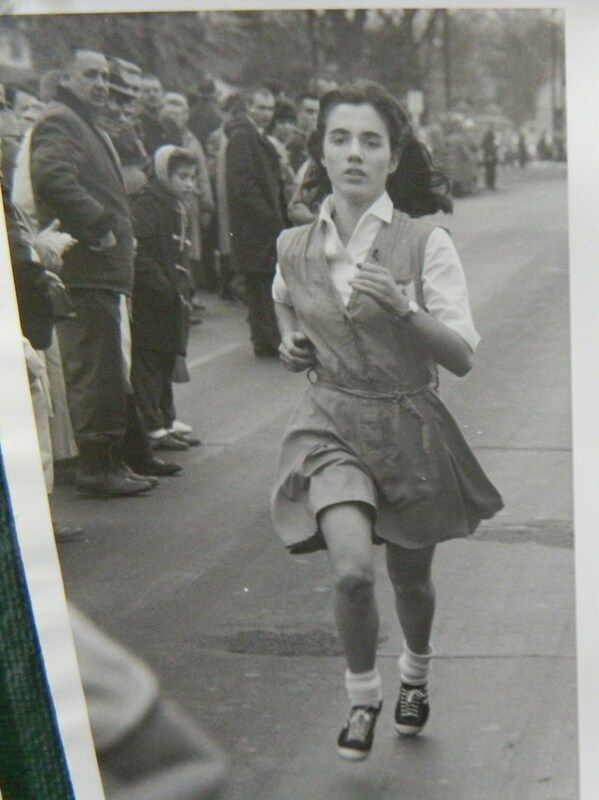 One of earliest women runners in the Manchester Road Race in Manchester, CT wearing her gym suit to compete. From a Manchester Historical Society collection, photo taken by Reginald Pinto for the Manchester Herald. We have come a long way since a mother worried her daughter ~ with sights on running the Boston Marathon ~ might not find a husband, since New York Marathon officials warned that distance running could cause a woman’s uterus to fall out, and since LIFE magazine ran a headline ~ “Tomboy Out On a Limb” ~ after a woman broke the gender barrier in the 1961 Manchester Road Race in Connecticut. “The best American women’s field ever assembled for Monday’s annual 26.2 mile trek from Hopkinton to Boston,” as described by sportswriter Lori Riley of the Hartford Courant, will take its mark this morning at the Boston Marathon. No matter what, this field of women would be news in the sports world. As the saying goes though, “timing is everything,” and timing makes this field of elite women runners ~ news bigger than the race. Apropos to the times, it is one more segment of society where American women are stepping up, speaking out and running to win. These are the times of the #metoo movement when women in thunderous voice are sounding off against sexual harassment in the workplace. These are the times when record numbers of women are expected to run for political office in the aftermath of the 2016 presidential election and accompanying concerns about the attitudes of powerful men towards women. As of January 2018, Emily’s List reported since the election of the sitting president, “more than 26,000 women have reached out about launching a campaign,” according to the dailybeast.com. And these are the times when an American woman could retake the title in the Boston Marathon. Held on Patriot’s Day, the third Monday in April, the Boston Marathon is the nation’s oldest, and arguably most storied, annual marathon, begun in 1897. It is organized by the Boston Athletic Association. Thirty-three years have passed since an American woman won the Boston Marathon. Today in Boston, the city considered to be the seat of American liberty, American women are real contenders. In a piece published April 11, 2018, Sports Illustrated noted reigning champ Edna Kiplagat of Kenya could take a back-to-back title. However, SI highlighted four American elite women runners, one of whom might well cross the finish line first. They are Marblehead, MA native Shalane Flanagan, Jordan Hasay, Desiree Linden and “pre-race favorite” Molly Huddle ~ with a respectful shout-out to 45-year-old Deena Kastor also slated to run this morning. And 45 is nothing. The Orange County Register reports that an 81-year-old woman and Ironman champion, Mickie Shapiro, will be one of the oldest runners on the course as part of Team Red Cross. This year also marks the 5th anniversary of the Boston Marathon bombing. BostonStrong! Let us commend the courageous men and women who continue to compete, and remember those whose lives were forever changed that day. One such woman is Gillian Reny, who nearly lost her right leg in the bombing. Thanks to outstanding medical care, she did not. Now age 23, Reny went on to establish the “Gillian Reny Stepping Strong Fund” which has raised $11 million for trauma research and is now based at a center for trauma innovation in Boston’s Brigham and Women’s Hospital, as featured on NBC news. 4/17 Update: Desiree Linden of Michigan took first place for the women in the 2018 Boston Marathon.